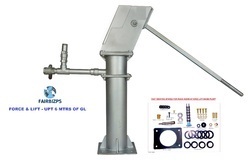 We manufacture and supply shallow and deepwell hand pumps. PUMPHEAD: Mild Steel Hot Dipped galvanised construction. WATER TANK: Mild Steel hot dip galvanised construction having socket for fitment with GI/SS/UPVC risers. CONNECTING ROD: Mild steel electroplated / hot dip galvanised / stainless steel (Grade AISI:202/304/316) with different inter connection arrangments. 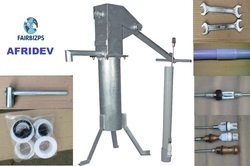 RISER PIPE: Galvanised Iron, Upvc, stainless steel. CYLINDER: Cast Iron brass sleeved , Upvc brass sleeved / stainless steel. PEDESTAL: Three legged standard, Telescopic, square flanged, with or without counter flanged. CASINGS: In steel / pvc. Plain, screen pipes. ... 17 liters per minute of 40 strokes. Bearing bushes for the pivot assemblies are made from injection molded special grade plastic. Variable handle settings suit changes in static water levels. 225 mm stroke length of the handle provides a water discharge of 17 litres per minute per 40 strokes with an installation depth range between 15 m to 45 m below ground water. Easy to install, can be accomplished by village women mechanics. Cone Plate and rubber Cone for improved attachment of uPVC Riser pipe to pump body. Extra long spigot ends in riser pipe to ensure high joint strength, leak proof pipe joints, and verticality of the pipe string. Rubber centralizers on riser pipes prevent external wear. Standard cylinder components are comprised of injection molded interchangeable plunger and foot valve assemblies, made from modern engineering plastics. The Afridev Pump’s cylinder is also suited to use cast gun metal monolithic plunger and foot valve assemblies of the Universal Cylinder. Alternative stainless steel lined cylinder is available for aggressive water conditions. Quick release eye & hook ‘tool-less’ ends on connecting rods with rubber centralisers, are standard supply. These facilitate maintenance and protect the riser pipe against internal wear. 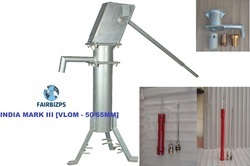 The VLOM (Village Level Operation and Maintenance) design has been developed for easy handling of maintenance problems without the need of special skills. Non-corrosive underground components are capable of handling corrosive water and therefore will last longer. Lightweight µPVC riser pipes; easy installation & inexpensive. Adjustable handle to suit varying installation depths. c. Skat -4, pedestaly with anchor assembly. 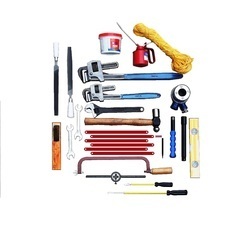 Cup Seal, U-Seal, bobbins and ‘O’ Rings are of Nitrile Rubber and Plunger Rod of Stainless Steel. 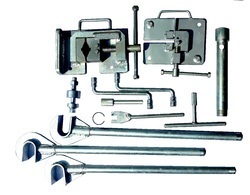 Mild Steel Hot-Dip Galvanized Rod / SS with Forged Eye and Hook Connectors welded at both ends. This provides easy Rod Connections without use of any tool. & also connecting rod with welded coupling. Each rod is provided with a Rubber Centralizer to avoid contact with µPVC Riser Pipe. Fulcrum & Rod Hanger Pins are supported on special grade Plastic Bush Bearings which are very easy to replace at village level. µPVC Cylinder 50 mm ID with Gun Metal Plunger Assembly / Inter changeable Plunger and Foot Valve made with special grade Plastic material. µPVC Pipe 63MM OD x 47 mm wall x 3 Meters long with socket-spigot cemented joint. We are offering an extensive series of Force Lift Hand Pumps. These products are extremely employed in the market for diverse purposes. 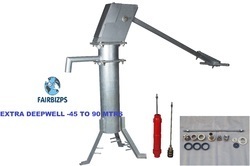 Due to our proficiency of this field, we are engaged in presenting Extra Deepwell Hand Pump. We are presenting these products to customers within given time-frame. 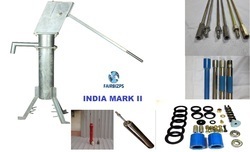 One can avail from us a quality approved assortment of India Mark II Hand Pump. Owing to their top quality, our products are extremely praised amongst the patrons.